Welcome to Day 27 of my ‘Album of the Year 2015’ top 30 countdown. Be sure to check out my choices from 30 down to 5 via the links at the bottom of this post if you’ve yet to do so. Or, if you’re a longer-term reader, thanks for your continued support. And remember, please keep the comments coming – I love them all, both positive and negative and will do my best to reply to them all. Well, here we are, into the final five places in my ‘Album of the Year 2015’ Top 30 countdown. Are you excited? I hope so. It has been a long journey to get to this point – late nights, early mornings and very little sleep in between. But it has been worth it, because it gives me the opportunity to do one of the things that I love the most: write about great music and those artists that deserve all the attention that they can get. 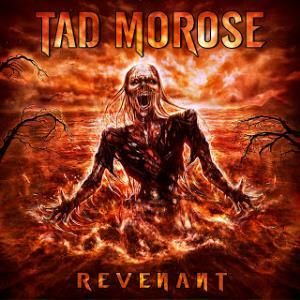 Tad Morose was formed back in 1991 and has so far released 8 studio albums, the first one exactly twenty years ago, the last but one ten years ago and the last one right now, after a decade of silence, not unlike Fates Warning. They toured and played festival stages on both sides of the Atlantic, Wacken Open Air (D), Sweden Rock Festival and Prog Power Festival (US) to name a few before they disappeared. Unlike Fates Warning, everyone thought Tad Morose were ‘dead’ and would never come back to life again. But now with 3 new bandmembers and their long awaited new album Revenant they are back again. Let’s see what the album brings! They have just about the most awesome stage show around. Of the whole set I actually knew only a few songs, I gather they played a good mix of new songs, songs from Imaginaerum and a few older ones. When they played Stargazer my beloved Nightwish was there! The lightshow and the visuals were just amazing, and of course pyro must not be missing. Floor is a great addition to the band, almost as good as Tarja in my opinion. US power metal favourites Symphony X have provided details of the bands who will support them on their February 2016 UK Tour. Myrath is a favorite of mine, I don’t know Melted Space, must look them up. Kerion present new album “CloudRiders Part II : Technowars” on Oct 30th !! More on Kerion here and here.